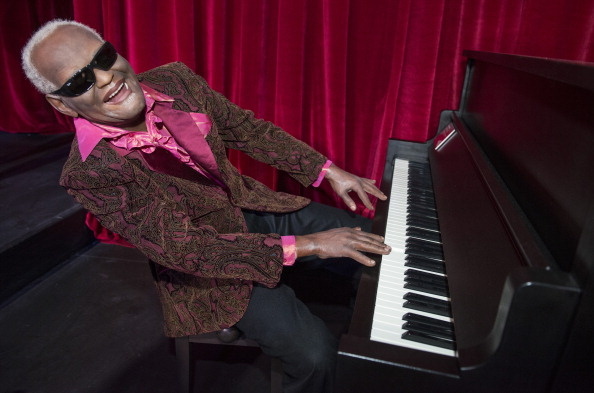 The wax figure US musician Ray Charles is seen during the grand opening of the Grévin Montréal, Quebec's newest entertainment and tourist attraction, on April 17, 2013 at the Eaton Center in Montreal, Quebec, Canada. The U.S. Postal Service has added a world-famous musician and Georgia native to its "Music Icons Forever" stamp series. Postal service officials unveiled a limited-edition stamp featuring Ray Charles, of Albany, on Monday along with one of the artists' previously unreleased songs. Events were planned in Atlanta and Los Angeles to celebrate Charles' induction into the series. R&B singer, Ashanti, and the Morehouse Glee Club performed at the school's Ray Charles Performing Arts Center, and Chaka Khan is headlining an event at the Grammy Museum at L.A. Live. The U.S. Postal Service honors music legends annually by featuring them on limited-edition stamps.